What a grocery store parking lot can tell you about a person and how they conduct business. As a successful entrepreneur, media strategist, author, and motivational speaker, I spend a lot of time around many successful people and people who want to be successful. I am also the mom of a very busy household and I do the grocery shopping. 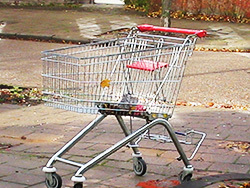 You can learn a lot about someone (and their business) by observing them in the grocery store parking lot, specifically the ones with shopping carts. There are those who do– and those who don’t– take the effort to put the grocery store cart in the metal holder provided in the parking lot. Yesterday at my neighborhood grocery store, I watched a woman leave her cart in the handicapped parking space next to her car and drive off. Then I watched a gentleman walk a cart from his car to the holder, giving me hope in the human race, then leave it a few feet outside of the thing that is designed to hold it. He couldn’t walk a few more feet to put it where it belongs. Hmmm. That got my brain churning (and my blood boiling). You go the extra few feet it takes to get the job done right. You do things because they are the right thing to do. No matter who you are or your position in life (or business), you aren’t above doing ‘menial’ tasks to get the job done. If that is what it says about you when you put the cart back, imagine what it says about you when you don’t. By the way, are you the one that really goes the extra mile, so to speak, and takes it back inside the grocery store? Wow. I want to do business with you!